Mark had this to say: First night home and he ate a bit last night and this morning and slept like a baby. Off to the Vet this evening for a full service so we can get him on the mend in full. He totally stinks so off to the groomers tomorrow with him. He keeps staring at me staring at him I think we're both still in shock in the best possible way. 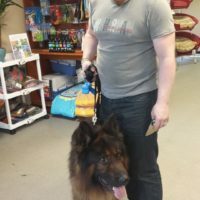 What happened to Bruno in those 18 months we will never know but this story is a true testament to not only how never to give up looking for your best friend but also the importance of microchipping. " In October 2012, 18 months ago, Bruno went missing from Laois, more than likely taken. On Sunday 6th April 2014, his owner Mark got a call to say that Bruno had turned up in Bray, Co. Wicklow. Bruno had gone up to a car at a junction and put his paws up on the drivers window as if to say take me home. Luckily he chose the right car and a lovely woman called Mary and her young daughter took him in and brought him to a vet who tracked his microchip and called Mark to let him know the news. Mark had this to say: First night home and he ate a bit last night and this morning and slept like a baby. Off to the Vet this evening for a full service so we can get him on the mend in full. He totally stinks so off to the groomers tomorrow with him. He keeps staring at me staring at him I think we’re both still in shock in the best possible way. What happened to Bruno in those 18 months we will never know but this story is a true testament to not only how never to give up looking for your best friend but also the importance of microchipping.